Toxicology is a comprehensive text for researchers and graduate students in toxicology and public health. It addresses every aspect of the field, starting with the fundamentals and incorporating such areas as organ toxicology, applications, and environmental toxicology. In addition to covering the traditional subject matter of toxicology, special emphasis has been placed on recent areas of interest, such as risk assessment, apoptosis, and methodical developments. Graduate students in toxicology, pharmacology, and public health; researchers; libraries. D. Milles, History of Toxicology. L. Hothorn and G. Hajian, Biostatistics in Toxicology. F. Oesch and M. Arand, Xenobiotic Metabolism. M. Younes, Free Radicals and Reactive Oxygen Species. R. Schulte-Hermann, B. Marian, and W. Bursch, Tumor Promotion. K. Tindall and R. Tennant, Transgenic Rodent Models. J.-A. Gustafsson and C. Corton, Receptor Biology and Pathobiology. D. Polka, Mechanisms of Toxicity: Programmed Cell Death (Apoptosis). J.P. Groton, P.J. van Bladeren, F.R. Cassee, C. De Rosa, and V. Feron, Mixtures. C. Cojocel and E. Lock, The Kidney. H. Muhle and R. McClellan, Respiratory Tract. P. Eyer and R. Klimmek, Blood and Blood Forming Organs. J. Riviere and N. Montiero-Riviere, Skin Toxicology. D. Ray and K. Andreas, Nervous System. D. Neubert and F. Welsch, Reproduction and Development. J. Thomas and M. Thomas, Endocrine System-Adrenal Cortex Thyroid and Pancreas. K. Schümann, B. Elsenhans, and E. Richter, Gastrointestinal Tract. G. Koss and I. Tesseraux, Hydrocarbons. H. Bolt and J. Borlak, Halogenated Hydrocarbons. E. Rose, E. Hodgson, and M. Roe, Pesticides. G. Koss and D. Wolfe, Dioxin and Dioxin-like Polychlorinated Hydrocarbons and Biphenyls. E. Richter and G. Sabbioni, Aromatic Amines, Nitroarenes and Heterocyclic Aromatic Amines. W. Köhl and G. Eisenbrand, N-Nitroso Compounds. S. Schäferwq, B. Elsenhans, R.L.F. Dawes, K. Schumann, and W. Forth, Metals. D. Warheit, T. Hesterberg, and G. Hart, Fiber Toxicology. L. Szinicz and S. Baskin, Chemical and Biological Agents. D. Hoffmann and E. Wynder, Active and Passive Smoking. J. Corbett, W. Dressler, and R. Sharma, Cosmetics. E. Löser and G. Stropp, Polymers. U. Hagen, R.J. Preston, R. Fry, and J. Kummermehr, Radiation. J. Westendorf, The Toxicology of Natural Compounds. H. Bigalke and H. Wellhoner, Bacterial Toxins. H.W. Rüdiger, Biomonitoring and Occupational Medicine. D.J. Paustenbach and T. Rodrigues, The Role of Toxicology and Risk Assessment in Environmental Remediation. Hattan and A. Rulis, Food Toxicology. Gelbke, B. Hildebrand, and E. Kerfoot, Toxicological Evaluation Methods for the Registration of Chemicals. H. Spielmann, Alternatives in Toxicological Testing. D. Neubert and R. Conolly, Possibilities and Methods of Quantitative Risk Assessment. S. Safe, Toxicity Equivalents and Their Use in Hazard and Risk Assessment. I. Ollroge, Threshold Values and Recommendations. H. Marquardt and S. Schäfer, Addresses of Toxicology Center and Information Sources. Dr. Seigfried Schäfer and Dr. Hans. 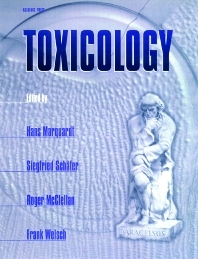 Marquardt are the editors of the very successful German edition of Toxicology. Dr. Seigfried Schäfer and Dr. Hans Marquardt are the editors of the very successful German edition of Toxicology. Dr. Roger O. McClennan is president and CEO of the very highly regarded and respected non-profit Chemical Industry Institute of Toxicology. CIIT conducts research directed toward reducing the uncertainties in assessing human health risks of exposures to chemicals. Chemical Industry Institute of Toxicology (CIIT), Research Triangle Park, North Carolina, U.S.A.
Frank Welsch is a senior scientist at the very highly regarded and respected non-profit Chemical Industry Institute of Toxicology. CIIT conducts research directed toward reducing the uncertainties in assessing human health risks of exposures to chemicals.